AN EPIC, LIVE-ACTION RETELLING OF THE STORY OF THE LEGENDARY CHINESE FOLK HEROINE. "Braveheart" meets "An Empress And The Warriors" in Mulan, a lavish, live-action period epic that breathes vibrant new life into the inspirational Chinese legend made internationally famous by Disney's classic 1998 animated feature of the same name. Directed by Jingle Ma (Seoul Raiders; Silver Hawk; Tokyo Raiders) and starring Vicki Zhao (Red Cliff; 14 Blades; Shaolin Soccer) and Jaycee Chan (Twins Effect 2), the son of martial arts legend Jackie Chan, Mulan is an extravagant, action-packed spectacle that tells a story of unequalled heroism and undying love set against the thrilling backdrop of a bloody war fought between rival warrior tribes and dynasties. When the emperor issues a decree that all families in the Northern Province must defend their homeland against the barbarian Rouran hordes, Mulan, a young girl from a military family without a male heir, disguises herself as a male soldier and enlists in the army rather than expose her aging father to the horrors of the battlefield. 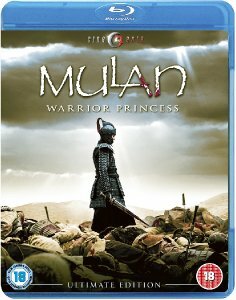 As the conflict develops and the invading armies close in, Mulan's remarkable courage and insights into the art of war see her elevated through the ranks until she is promoted to the position of general, establishing herself as a true military leader willing to sacrifice everything to defend her nation and bring honour to her family. Her only weakness is her affection for one of her comrades, Wentei (Chen Kun), a fellow general who realises that their mutual emotional attachment could lead to their downfall on the battlefield. Awe-inspiring, compelling and filled with astonishing action-sequences, Mulan is both a moving romance and an exhilarating and brutal action-adventure of epic proportions. Mulan (cert. 15) will be released as a two disc Ultimate Edition DVD (£17.99) and as a single disc Ultimate Edition Blu-ray (£24.99) by Cine Asia on 21st June 2010. Special Features include: 'Making Of' featurette; 'Behind The Scenes' featurette; interview gallery; Dolby Digital Mandarin 2.0 and 5.1 audio options (DVD); TS HD Master Audio Japanese 5.1 and Dolby Digital Mandarin 2.0 audio options (Blu-ray); English subtitles; original trailer.